+ Where will Centre for Arts & Design be located? 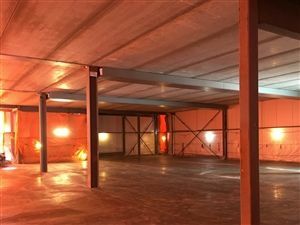 Our new 16,970 sq. ft. centre will be a 3-storey building on the riverside of the campus, behind Sifton Family Theatre and adjacent to the Boarding House. Floor plans can be viewed online. + Who will use this new facility? 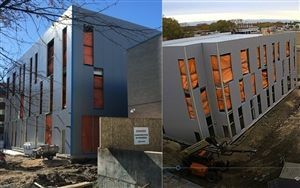 All students from Child Care to Grade 12 will have the opportunity to take full advantage of our Centre for Arts & Design. Each of the flexible learning spaces has been designed to complement and enhance current programming. In each space, students will be given the opportunity to become actively engaged in designing their educational experience, making learning powerful and memorable. The possibilities are endless! + What does STEAM mean? At Balmoral Hall, we inspire girls to blaze a trail and be pioneers by developing STEAM skills. This is much more than a focus on science, technology, engineering, and mathematics. To ensure creativity is valued, arts are integrated into core subjects. Research shows that arts enhance critical thinking, problem solving, memory systems, and analytical skills - all crucial for achieving success. Early integration of the arts in education will transform our world just as science and technology did in the last century. + When did the school start working on this project? In November 2013, the Board of Governors approved the expenditure of funds to develop concept drawings and cost estimates for the centre. Since then, the school has held extensive consultations with neighbouring communities and worked with architects on an evolving design for the new building. 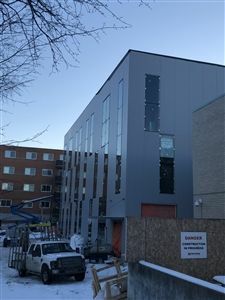 In June 2016, City of Winnipeg officials approved a Variance and Conditional Use, granting us permission to proceed with construction as soon as possible. In October 2016, the Board of Governors offered unanimous support for the project. + How will the student population be impacted? There are no plans to expand the size of the student population beyond our current capacity. Our Centre for Arts & Design will provide a necessary expansion of our students’ learning environment. The total projected cost is $6M including fees, furnishings, and construction costs. + Will tuition fees be increased to support this project? No, we have not modelled the financing structure of this project on increased fees. + Why should alumnae support? There is a strong tradition of philanthropy at Balmoral Hall School and a desire to “pay it forward” to the next generation of young girls who will make their mark. As a small independent school, we rely on the generosity of our community, past and present, to make projects such as this possible. + When will construction begin and end? With such a positive response from our donor community, construction began in April 2018. We will continue fundraising during construction. The anticipated completion date is Spring of 2019. + Is there a minimum donation amount? As a special initiative of the Annual Fund, participation is still of utmost importance. Every year, small and large gifts make a huge difference in the lives of our students. If this project resonates with you, consider directing your support here. + Can I Donate Building Materials? As a donor-funded project, our goal is to manage costs to the very best of our abilities. As we enter detailed planning stages, we are inviting donations of product or at-cost pricing. Contact Amanda in Advancement at (204) 784-1605 or akostyk@balmoralhall.ca to advise us of your interest. We will be working throughout the fall 2017/winter 2018 to follow up with any interested supporters. + Can I make a pledge over more than one year? Absolutely. Our hope is to receive the majority of donations as soon as possible; however, donations of all sizes can be pledged over 2 to 3 years. + How will my gift be recognized? All donors will receive recognition in school publications and on the website, if public recognition is desired. The school is delighted to offer a limited number of naming opportunities for select spaces in our Centre for Arts & Design. Donations can also be made anonymously. Contact Executive Director Tina Alto or Head of School Joanne Kamins. The design and vision for Balmoral Hall School’s Centre for Arts & Design drew inspiration from thought leaders such as IDEO and Harvard’s Project Zero. Each level has been thoughtfully designed to inspire creativity, encourage collaboration, and create experiences that make learning so powerful and memorable, students are empowered to develop a lifelong sense of curiosity. The Visual Arts Level will invite students to explore the world of 2D and 3D design. Visual arts encompasses ceramics, drawing, painting, photography, and more. This space will provide a place where students can research, collaborate, redefine, and carry out two-dimensional designs, or it will transform into a builder's space to encourage students to be creative, develop hands-on problem-solving skills, and come up with tactile, innovative solutions. The gallery directly outside the studio will provide an excellent space for students to learn to stage and/or showcase their work. The Performance and Production Level is a flexible environment. Equipped with a digital recording studio, students can perform as a group as well as learn how to compose, capture, edit, and produce both vocal and instrumental recordings. Students will use Theta 360 cameras and VR headsets to not only consume but create virtual reality experiences. A large projection screen will allow students to preview, reflect on, and showcase all digital designs created throughout the entire facility. The Movement and Design Level combines a space where the human and digital environments can come alive and communicate with an audience by using movement as a form of expression. Who needs a dance partner, when you can program a robot to perform with you? Whether through traditional dance or in combination with computer science as students use data visualization to harness the subtle movements of dancers, this space will encourage the use of design thinking in all aspects of learning. An idea lab provides a space where students can unpack design thinking. Their ideas are only limited by their imaginations as they move from ideate to prototype to test (and re-test). Specially ventilated, this lab is equipped with workbenches, tools, and machinery needed to create (e.g. 3D printer, CNC, laser cutter, routers, soldering guns, et cetera). The learning commons, a place where students can collaborate or reflect quietly, becomes an extension of both the movement studio and the idea lab.